This seems right to me... I know I'm a cultural libertarian and in general, I'd prefer power be given to individuals rather or regional/state/local organizations than vested in the Federal Government. If I'm convinced of one thing, it's that the more decentralized power is, the freer we all are- and the stronger our communities can be. But weirdly, when I found out what UK Parties I matched up best with based on their last general election, I was closest to their Green Party. And the current general election here at home? Well, again, a surprise... 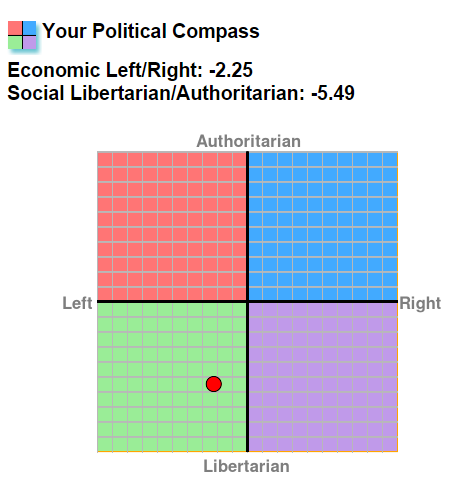 I'm closest to Bernie Sanders- though that's for a given value of 'close'- there's still plenty of distance between us. Everyone talks about the 'libertarian moment.' People flirted with Ron Paul, Rand had a brief flicker of hope before wilting under the carnival of destruction that is the GOP race. If we're heading into a post-industrial economy, where people change careers four or five times over the course of their life and the whole concept of work may be dying out or on it's way to becoming obsolete, then I feel like a philosophy that gives individuals the tools they need to function in a fast-paced economy where you have to float like a butterfly and sting like a bee, as it were is the best way to go. Clunky, large bureaucracies seem increasingly antiquated and part of the status quo- a status quo that seems increasingly untenable to me. In the age of the internet, there's no reason why power needs to emanate from the top down when it could easily do so from the bottom up. That's not to say that Bernie is wrong about everything. Breaking up the big banks? Fine by me. Infrastructure spending I have no problem with, because if my tax dollars should go to anything, it should be to roads and bridges and making sure they work. In this country- which is among the richest in the world is it is ridiculous that we don't have paid family leave or a living wage. It's troubling, if not outrageous that people have to choose between health care and rent. Or food. The questions are legitimate, the issues real- we just disagree on how to do it, which is fair, I guess. I actually took this test twice and got the same result, so I'm pretty confident about my location on the 'compass' so to speak. This feels... right to me. My little corner of the spectrum. Where do you stand?